When English language teachers (and other languages, too) talk about "metalanguage," they primarily mean the "language" used to talk about the target language. A simple example would be if I say "present perfect progressive sentence" to talk about the form and functions of a sentence like "I have been studying English since I was a child." Using metalanguage is an easy way for teachers (and others) to talk about a language. It's not a great idea to use metalanguage to teach English language learners. It's better to go directly to the target language. For example, if I'm teaching the Simple Present, I would use and elicit the target language. I might ask, "What do you do every morning?" In this case, I am hoping to get something like, "I eat breakfast." I am using the Simple Present, rather than talking about the Simple Present. I do use some metalanguage when I am teaching advanced ESL students. They usually know all the names of grammar parts, and so it saves a lot of time to use the shortcut of metalanguage. I was tutoring an advanced ESL student today. He's a doctoral student at one of the top universities in the U.S. He asked me to primarily help him with his writing skills. I always focus on the areas my advanced students want to focus on, as opposed to beginning ESL students who need me to guide the directions of our ESL lessons a lot more. Some small thing came up today about pronunciation. I started talking about the many vowel sounds English has, yet we only have five vowels (sometimes six with the letter "y"). I wrote and said, "a, e, i, o, u." He asked me to repeat the vowels. He said that this was the first time he'd heard a native speaker say the vowels. I usually try not to make assumptions about what English language learners know or don't know. I'll often ask about something just to make sure. I never thought to ask about something as basic as the vowels. I learned that I still make certain assumptions and need to be even more conscious. I hear many ESL speakers use "over there" when "there" sounds like the better option to me. If I hear it consistently from a student (or even from a friend whose native language is not English), I will try to offer a correction or suggestion. My difficulty with this particular choice of words is that I myself do not have a clear handle on the reason(s) that one choice should be made over the other. I haven't seen this explained in any of the ESL textbooks I use for my ESL students or for my own reference. It's one of those slight differences that I can discern as a native speaker. I know in the particular situation which is better, but I can't give a generalization of why one is better. So I've just had to try to give examples of when to use which. If I find something definitive or if you have any suggestions for me, I'll be sure to offer them here. For ESL teachers teaching writing, the teaching isn't only about grammar and punctuation. It may not even be about teaching structure or how to do an outline first. Sometimes, helping ESL students is about helping them to think about the answer to a question they may not have thought about before. Sometimes, being an ESL tutor is like being a psychotherapist. I was recently helping two young community college students with a writing assignment for their English class. One student was nineteen years old and the other was twenty years old. The question for which they had to write an essay was something like, "What matters in life at any given time and what really matters in life are often different things. Write about three things that really matter. Give details. How have these three things helped to shape your moral world view." Although these are not the exact words of the question, they are very close. The first thing I thought about this question was that the question was not written very well. This becomes particularly apparent when you start to take the question apart and try to answer it. Such a question is particularly difficult for English language learners. In addition to helping my ESL students with an outline, the grammar, vocabulary, etc., I also had to ask probing questions of my students about their values and what really matters to them and why. Initially, they had no clue what to write about. After several of my questions, they came up with some answers. Then we had to come up with the "why" for the answers. The students' answers to the teacher's question took quite a while to develop. 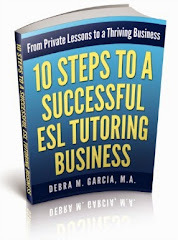 As an ESL tutor, it was part of my job to help the students develop the answers (and of course, to help them to express their ideas in English). I also was very conscious of not imposing my views or moral judgments on the answers they had. Overall, this was a very challenging writing assignment for both the ESL students and their tutor. Happy International Women's Day to my ESL students, and to all. I find it interesting that all of my students studying English (both male and female and no matter what country they are from) know what day today is. I suppose it shouldn't be surprising. Probably more interesting is the contrast: only about half the Americans I know are aware of the day. About a quarter of my ESL students at any given time are attending university or community college. These English language learners tend to need help writing papers for classes. The challenge for me as an English tutor is the limited time with which we have to work and complete the paper. 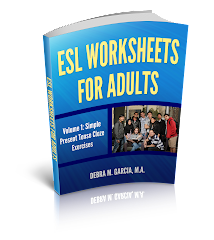 College ESL students who have sought out my service as an ESL tutor have wanted help in completing their papers and not specifically to learn grammar, vocabulary, and all the other typical topics covered in ESL classes. Of course, they often need these things as well, but the most important thing is the looming deadline and getting the paper completed. As an ESL tutor, I find that I have to find a balance between suggesting the way something should be written (for the sake of expedience) and honoring the words, intentions, and ideas of the student. For me covering the general topic of "writing" has been a challenge, especially when the English language learner is still struggling with the English language. It also takes a lot more time and so I find that I have to limit the number of students I take on who want to improve their writing. Of course, "improving writing" is different from helping with a paper that has a deadline of next week. We can take longer for "improving writing," generally, and veer off onto other topics (grammar, vocabulary, etc.) when needed.